Christmas is coming soon, now is the time to plan that special activity, craft, or Bible lesson. This page lists some of the most popular resources on our website related to Christmas. There are lots of things and people to be thankful for all throughout the day. Each of the seven color tabs in this colorful prayer book corresponds to a different blessing and the pages feature objects of the appropriate colour for children to identify. It presents very simple prayers featuring a theme or subject that relates closely to the world and everyday experiences of a young child. Filled with colourful, cheerful illustrations, this is an ideal resource for toddlers and parents alike. It can be difficult to help young children find the space for personal prayer in their lives, between school and friends and church. Quiet corners helps to show them that prayer doesn't just have to be for Sunday school, or when they're tucked up in bed. Creative Ideas for Quiet Corners is designed to encourage children to find space for prayer by creating a physical prayer space in the home or at church that children can visit and enjoy. Each prayer idea uses simple but effective materials to create a quiet, reflective corner. The book also offers practical support to parents and leaders, so they can help children to move at their own pace into a sense of quietness and prayer. Creative Ideas for Quiet Corners is ideal for children aged 6-10. It is also suitable for children's workers looking for a focus for creativity and prayer. Perfect for bedtime or anytime, Barnabas Children's Prayers is a beautifully illustrated collection of simple prayers, designed to help children pray about the different experiences encountered in daily life. The collection contains nearly 40 different themes covering a wide variety of topics, such as God's love for us; our concerns for ourselves, other people and the world; celebrations and holidays across the year; our family, friends and pets; and many other aspects of everyday life. The range of subjects is broad and refreshingly bold including several for Good Friday and, from a child, one for their soldier brother. The book has prayers written by named authors and includes prayers written by children ranging in age from five to nine.The illustrations are delightful and help make this a lasting gift and resource in one volume. Alternatively, each unit stands alone so that the phrases can be studied separately and linked into the teaching of a Bible passage springing from the phrase. Each phrase of the prayer is explored through colourful, creative ideas, offering a wealth of thematic gems for Children's workers and teachers to pick and choose to suit. Ultimate Creative Prayer is crammed full of creative and imaginative ways to help you and your children's group get praying. Ideas include prayers to draw and make, prayers to shout and sing, prayers to pray alone and pray together. Inside you'll find all the instructions and guidance you need to help your group pray and grow together. What on earth have candles, autumn leaves, magazines, sandpits, pebbles, seeds, mirrors and DIY labyrinths got in common? Well, the answer is they can all help you pray. Sue Wallace presents a tried-and-tested collection of fresh and inspiring ideas to help this generation meet God in active, experiential prayer. A collection of over 60 ideas to help you meet God in active, experimental prayer! It includes hands-on, step by step tips on everything from innovative new techniques, meditations and rituals borrowed from across the Christian tradition. This is an adaptable resource for use with all ages. Is a compilation of great ideas for communicating the message of Easter. It is full of different approaches to learning these truths - drama, stories, games, craft activities, illustrated talks, songs, rhymes and ideas for events - all tailored for various age-groupings, including for times when all ages are learning and worshipping together. More Easter Cracked is a flexible resource, allowing leaders to choose ideas from different sections according to the needs of their group or congregation. Is a great resource for the whole of the Easter season covering such things as craft, drama, events and service outlines. It contains all-age service outlines for Palm Sunday, Good Friday and Easter Sunday and features all-age events for Passover and Good Friday, plus assembly outlines and further ideas. Mary has a friend called Jesus. Everywhere Jesus goes, special things happen. But one day soldiers march him away to die on a cross. Mary is very sad - until on Easter Day in the morning, something amazing happens. This is the perfect introduction for children to the events of the first Easter. Age range: 4-6 years old. Apart from the human resources available at the Synod Office, we are building up a resource of books, DVD's and magazines that can be made available to the churches of the Synod. We have catalogued all that we have available and are increasing the lists with new editions on a regular basis, keeping them up to date and relevant. it is also possible that we may know where you can obtain other resources not listed here so do ask. This list is not exhaustive and liable to change so do check it out from time to time. If you would like to borrow a play parachute for your events, holiday clubs, messy church, etc. you are very welcome to contact me. For more than two decades, Youthwork magazine has been equipping and helping youth workers with a monthly dose of ideas, resources and guidance. Whether you’re a full time youth pastor or an extra-time volunteer, this magazine is for you. It’s the UK’s biggest and fastest-growing children’s ministry resource, you’ll find creative ideas, thought-provoking feature articles and wisdom from seasoned children’s workers. "Messy Church Magazine - Get Messy"
Get Messy! is a new four-monthly subscription resource for Messy Church leaders. Each issue contains four session outlines (one per month), including planning sheets and take-home handouts, together with information on the latest resources and events. including planning sheets and take-home handouts, together with information on the latest resources and events. What is the Place of Children in God's Kingdom? 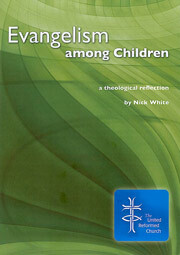 What approach to Evangelism among Children?